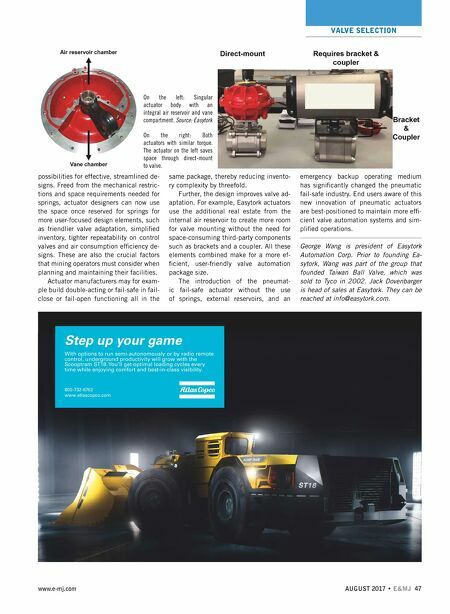 VALVE SELECTION 46 E&MJ • AUGUST 2017 www.e-mj.com Although space has been a long-standing hurdle in the actuator industry, innovation around this restriction didn't take place until recently. In fact, up until the late 2000s, no fundamental improvements or disruptions to pneumatic actuator designs occurred. The old generation of valve actu- ators typically relied on internal springs. In this design, when the actuator moves the flow control element away from its starting position (open or closed), it compresses the internal spring and then uses the energy stored in the spring to move the control element back toward its starting position. There are a few reasons why spring- controlled actuators are less-than-ideal for the mining industry. First, they are inherently neither size- nor cost-effective, because the actuators must be sized to overcome the spring tension and account for the necessary torque of the valve and system. This translates to oversized ac- tuators, which in addition to taking up unnecessary space, also means a high- er price tag. Add the spring assembly to these costs and the price quickly climbs to 30% to 80% more than the standard double-acting actuator assembly. Addi- tionally, springs are subject to corrosion from atmospheric conditions and degra- dation from constant compression. Alternatives are available. They use air reservoirs to store compressed air needed to supply the required force to fail the valve to the fail-safe position. However, air res- ervoirs have traditionally been supplied as an added piece of equipment that requires custom brackets and mounting hardware. External reservoirs require ASME code-cer- tified tanks that are mounted to the actu- ator assembly. These reservoirs not only add to the size and cost of the system, but they also require a considerable amount of external tubing. These considerations add to the overall footprint, which limits the usefulness and cost efficiencies. A new generation of pneumatic actua- tors addresses these hurdles. Instead of springs or external reservoirs, the new gen- eration of actuators relies on internal air res- ervoirs to store the compressed air needed to supply the force to fail the valve to the fail-safe position. Unlike spring-based de- signs, the new generation of actuators is not oversized to overcome spring tension. And unlike external reservoirs, internal reservoirs do not require space-consuming brackets, mounting hardware or external tubing. These developments lead to an exponential reduction in the actuator's size and weight, while reducing air consumption. The Easytork model integrates the res- ervoir into the pneumatic actuator housing, resulting in one compact package. With the proper pilot assembly, the reservoir is constantly pressurized and able to perform the fail-safe operation during a power fail- ure or catastrophic air failure. When those situations arise, sufficient air is main- tained in the reservoir to fail the valve in the pre-selected fail position. 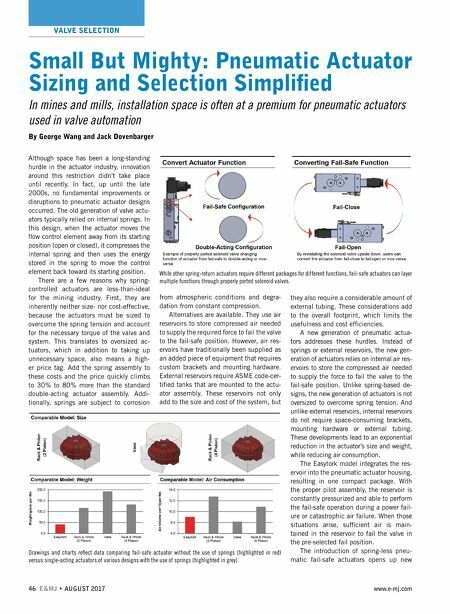 The introduction of spring-less pneu- matic fail-safe actuators opens up new Small But Mighty: Pneumatic Actuator Sizing and Selection Simplified In mines and mills, installation space is often at a premium for pneumatic actuators used in valve automation By George Wang and Jack Dovenbarger Drawings and charts reflect data comparing fail-safe actuator without the use of springs (highlighted in red) versus single-acting actuators of various designs with the use of springs (highlighted in grey). While other spring-return actuators require different packages for different functions, fail-safe actuators can layer multiple functions through properly ported solenoid valves.